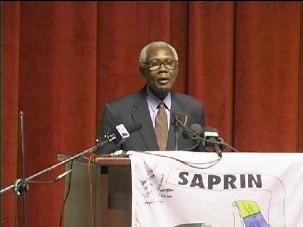 Daniel Annan was born in Accra, Ghana on November 7th, 1928 and died on July 16th, 2006. He had his secondary education at Accra Academy from 1939 to 1945. He then proceeded to Achimota College from 1946 to 1948 to complete his pre-university education. Justice Annan then travelled to the United Kingdom to study law at the University of Hull. He obtained the LL. B (Hons) degree in 1956 while there. He was called to the bar at the Middle Temple, UK, in 1958. He was called to the Bar in 1958 at Middle Temple, UK. Mr Justice Annan served at the Attorney-General's Department from 1958 to 1964 as Assistant State Attorney, State Attorney and Senior State Attorney. He then moved to the Bench in 1964 when he was appointed as a Circuit Court Judge from 1964 to 1966, High Court Judge from 1966 to 1971 and then Appeal Court Judge from 1971 to 1979. Mr Justice Annan was also the Stool Lands Boundaries Settlement Commissioner from 1974 to 1976 and Member of the Legal Class Appointment Board from 1974 to 1976. Mr Justice Annan was a keen sports lover. He was Chairman, Ghana Boxing Promotion (1973-1976) Chairman; Boxing Authority (1980-1982) and President, Ghana National Olympic Committee (1983-1985). On the media realm, Annan was also appointed the Chairman of the Press Freedom and Complaints Committee of the Ghana Press Commission in 1980. He also served as Chairman, Ghana Police Council in 1984 and Chairman, National Economic Commission in 1984. Mr Justice Annan held several positions under the Provisional National Defence Council (PNDC) and National Democratic Congress (NDC). He was appointed Member, Provisional National Defence Council, 1984 and Chairman, National Commission for Democracy in 1984. One of his high points was in January 1993 when he was appointed Speaker of Parliament, a position he held under two successive Parliaments from 1993-2000. Ghana News Agency. "Justice Annan is dead". General News of Monday, 17 July 2006. Ghana Home Page. Retrieved 2007-03-29. Ghana News Agency. (2007). Justice Daniel Francis Annan". Ghana Famous People. Ghana Home Page. Kotey, N. (2007). Accra Aca Is Calling. Accra Academy alumni.